A beach home owned by former Governor and current congressional candidate Charlie Crist is up for sale. He's back! Or hopes to be, at least. In one of the worst-kept secrets in politics, Charlie Crist officially entered the race for Congress, in a soon-to-be-newly-configured district that should include his hometown of St. Petersburg. Former Gov. Charlie Crist appears likely to run for a Pinellas County congressional seat in 2016, two years after losing a comeback bid for the governor's mansion. Crist said Monday he will run for Congress if, as expected, he is included in a newly redrawn district that would be friendly to Democrats. "If the new congressional map includes my home, I intend on running to serve the people again,'' said Crist, a St. Petersburg Democrat who was elected governor in 2006 as a Republican but later switched parties. So you’re a Florida Democrat. You’re looking for a silver lining to the humiliating Sunshine Shellacking your party took in Tuesday’s midterm elections. There really isn't one. But there may be a pewter lining: Your gubernatorial candidate, Charlie Crist, lost to the Republican incumbent, Governor Rick Scott, by only a percentage point. 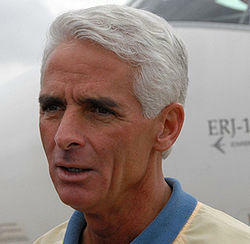 What's more, Crist might have won if not for a dumb political move by President Obama that alienated Latino voters. Pattrik Simmons contributed to this report. Gov. Rick Scott won Tuesday's elections with a slim margin over former Gov. Charlie Crist, who was briefly rumored to call for a recount. Considering Florida's elections history, the governor's race was over relatively early, results well settled by midnight. But not before some initial suspense. What will the Florida Legislature look like with Republican Rick Scott or Democrat Charlie Crist as governor? A lot depends on whether Republicans not only retain control of the Legislature, but regain a super majority -- making their policy decisions veto-proof. The race between Florida Gov. 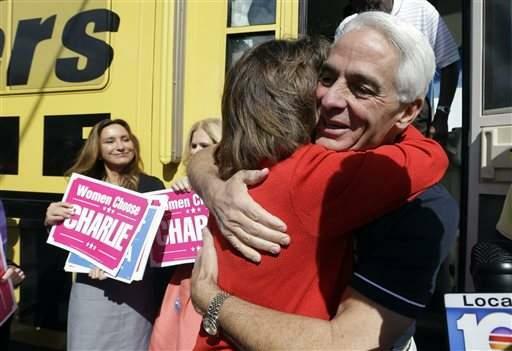 Rick Scott and his Democratic challenger, Charlie Crist, remains essentially tied as the campaign enters its final day. A Quinnipiac University poll released Monday showed Crist had 42 percent of the vote to Scott's 41 percent. Libertarian Adrian Wyllie had 7 percent with 9 percent undecided. A Quinnipiac poll last week showed Crist with a 43-40 lead. The finger-pointing and mudslinging almost is over. There is an end to the negative ads. Floridians will choose their next governor and it's safe to say that man already has served as governor. And he has served as a Republican. It’s down to the final days of the 2014 campaign. Governor Rick Scott and former Governor Charlie Crist make last minute pitches as more than one million Floridians already have voted. But this is Florida. And this is an extremely tight race for governor. What will happen if there’s a recount? Note: This story was originally posted on Oct. 14. The audio is an updated version of the story. On the Florida Roundup, the debates between Rick Scott and Charlie Crist are over and early voting is underway. The newest Quinnipiac poll shows the candidates are tied - and gender divides within both support bases - and now Scott will use some of his own money in the campaign.